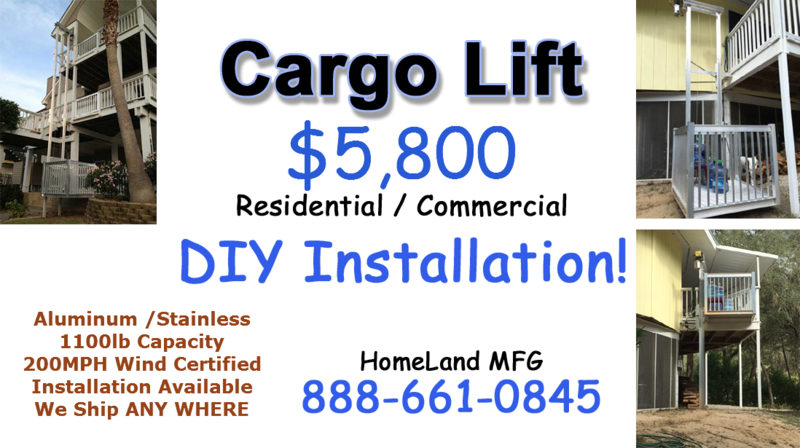 Cargo Lift with BIG BASKETS, Realistic HEAVY CAPACITY and the BEST VALUE on the Planet, $5,800.Click the Audio Link Below to hear our Radio Advertising. 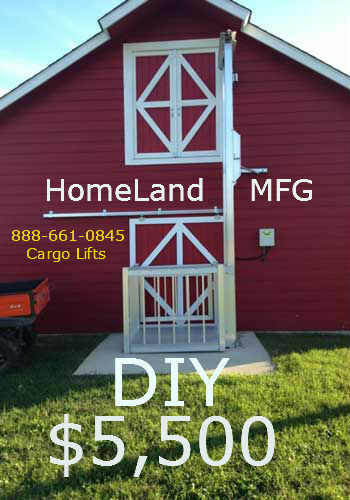 Cargo Lift with Easy DIY Install. 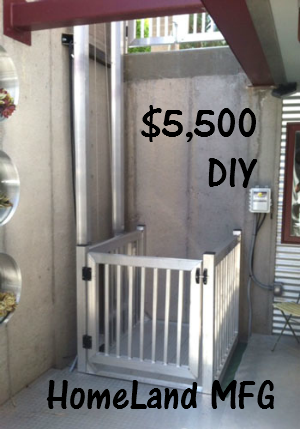 Commercial and Residential Material Lifts with Aluminum Construction, $5,800. 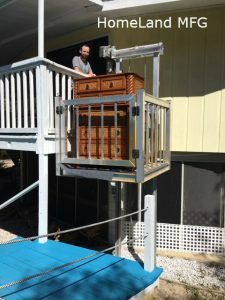 Unique Cargo Lift set-up for a 10' deck on a stilt home. 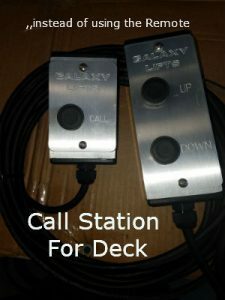 Has a mid deck 'remote controlled' mid-stop for a garden deck. 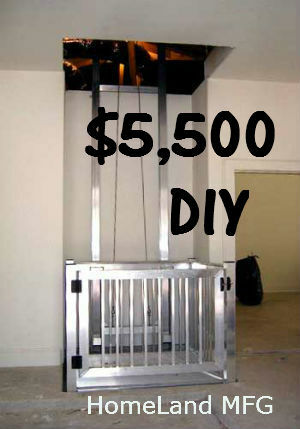 Residential / Commercial Cargo Lifts with BIG BASKETS, Realistic HEAVY CAPACITY and the BEST VALUE on the Planet, $5,800. 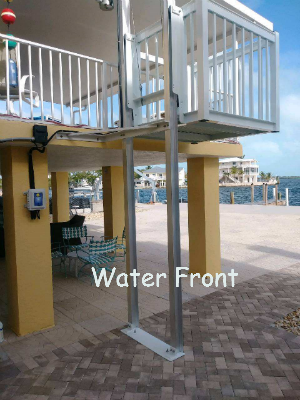 These Lifts are manufactured with durable stainless steel and aluminum welding to last a lifetime. 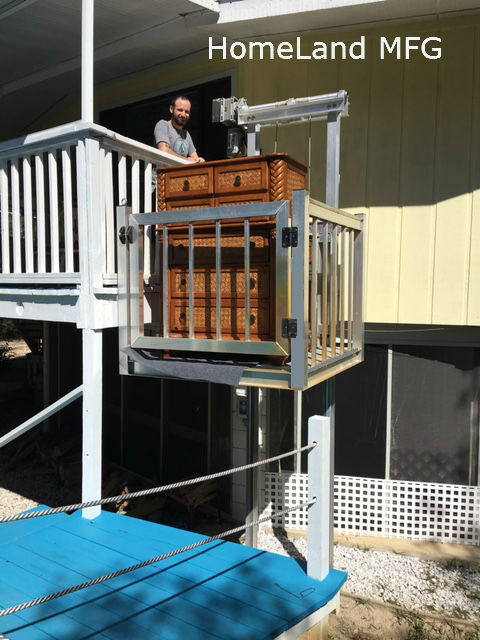 Our lifts are excellent for raised coastal region homes and storage lofts. 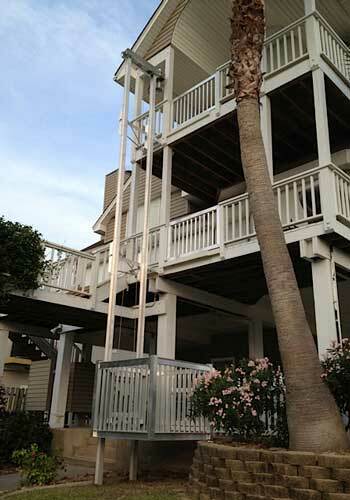 Lifts are routinely used to transport groceries, luggage and large items such as furniture and refrigerators. 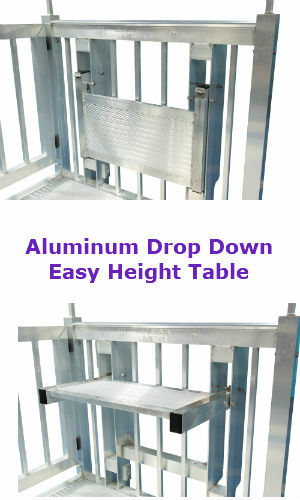 These freight lifts can be used commercially to access a storage mezzanine or deck. Our cargo lifts are rated to 200 MPH wind gusts. 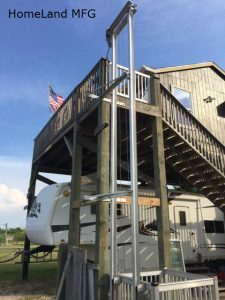 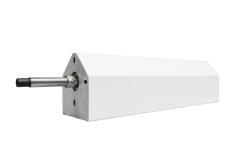 Our LIFTS are equipped with a dual mast, dual cable, single motor, remote control, and a sturdy platform. 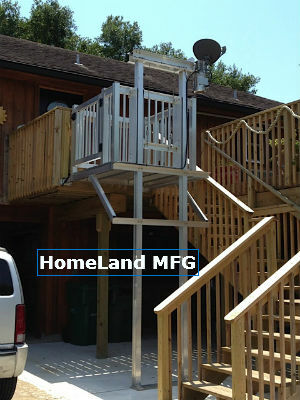 Platform System exceeds industry standards for durability, safety and technological efficiency. 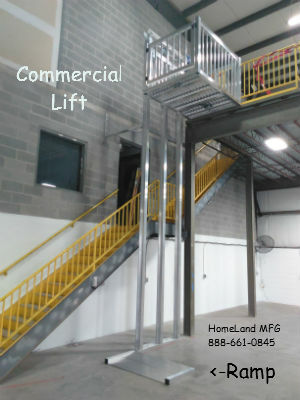 Our Lifts are used in Industrial as well as Residential applications. We also can arrange for shipping and same day installation too on weekends. 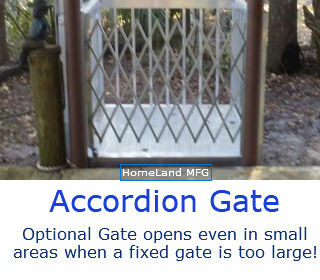 Shipping charges are NOT included. 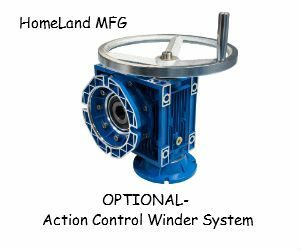 Dual winder and dual cable—with no pulleys—to eliminate cable friction and ensure long life and durability. 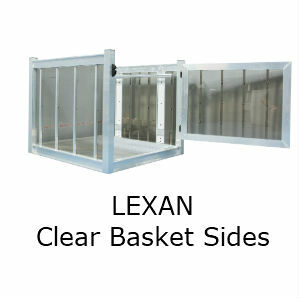 Transports up to 1100 lbs. 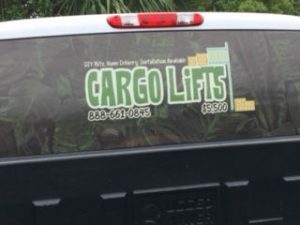 2 stop and 3 stop cargo lift options. 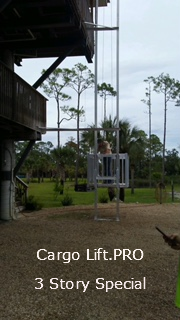 Lifts at a rate of 14 feet per minute. 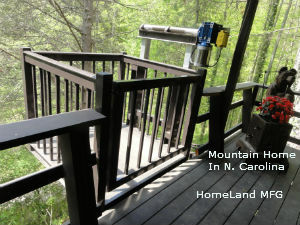 Engineered for indoor and outdoor use. We ship to the Bahamas and S. America too ! 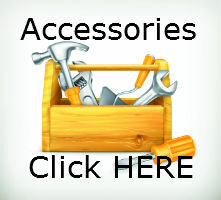 Dedicated Trucks for FAST Delivery and Installation. 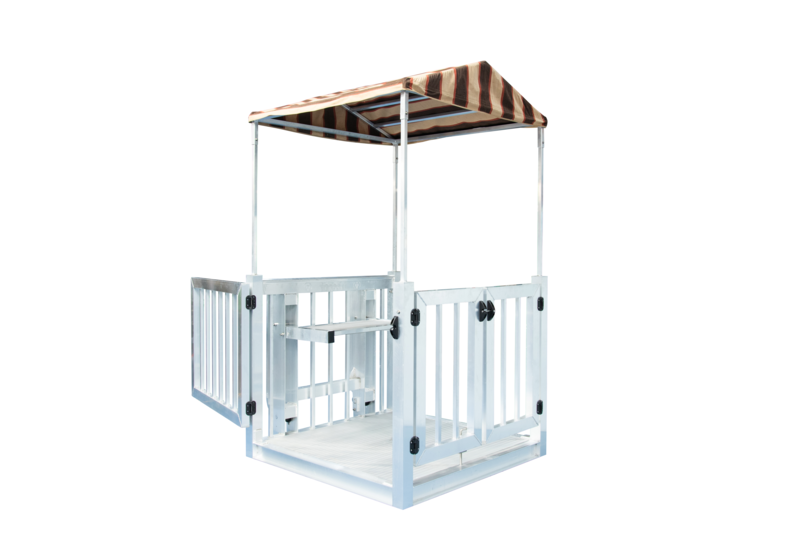 Our cargo lifts can be customize to fit your needs with various options and add-ons. 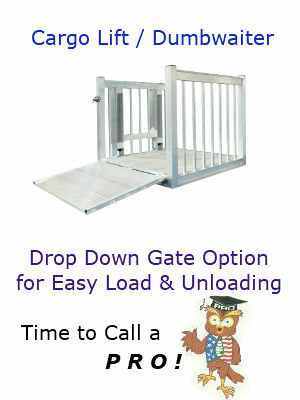 All cargo lifts can be powder coated any color and additional remotes may be ordered. Our Voyager model can have extra height beams and a custom basket size. Our cargo Lift System is rated at 200 MPH wind gusts. 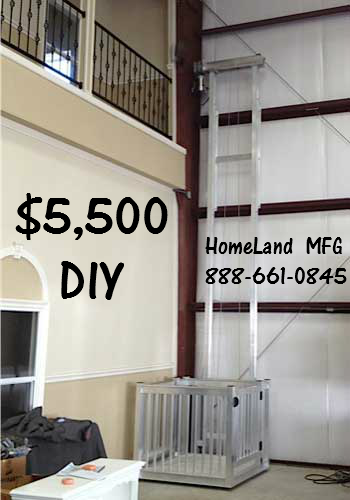 Call a PRO, 888-661-0845. 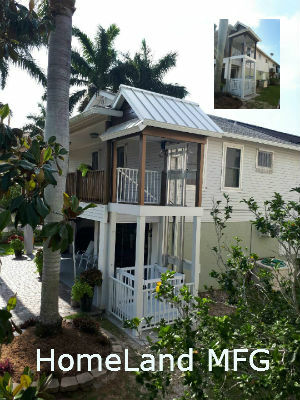 We can add Decking and Shelter for a TROPICAL look too! 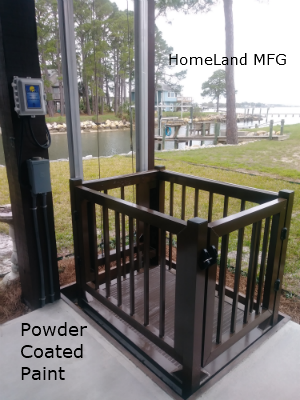 Special Brown Powder Coat paint. 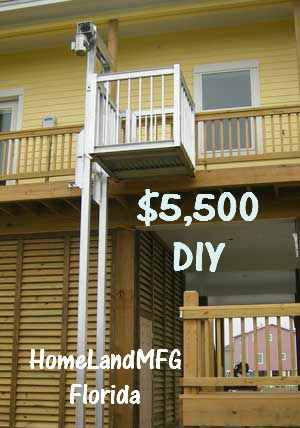 CUSTOMER installed in recessed concrete decking. 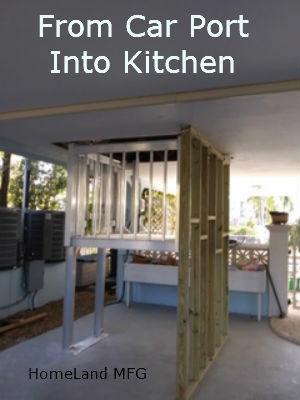 Installed Through the Floor. 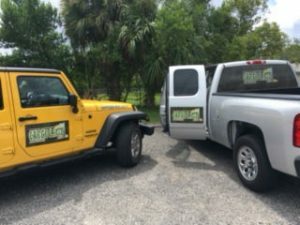 NEVER get wet from the Rain!